The flesh-footed shearwater is a migratory seabird found widely in the Pacific and Indian Oceans. The principal breeding populations are in Australia and New Zealand. The only breeding site in eastern Australia is on Lord Howe Island. Populations in recent decades have been in decline. In 2005, marine biologist Jennifer Lavers discovered 79% of shearwater chicks had plastic in their stomachs, fed to them by their parents which scooped the plastic up as it floated on the surface. Yearly studies have seen the problem worsen. Now all shearwater chicks carry plastic in their stomachs. It can be as much as 15% of their bodyweight. Plastic attracts and accumulates heavy metals in seawater and these toxins are now found in many marine creatures. Ian Hutton describes the ongoing studies on flesh-footed shearwater birds which spend the winter in the now radioactive waters east of Japan. 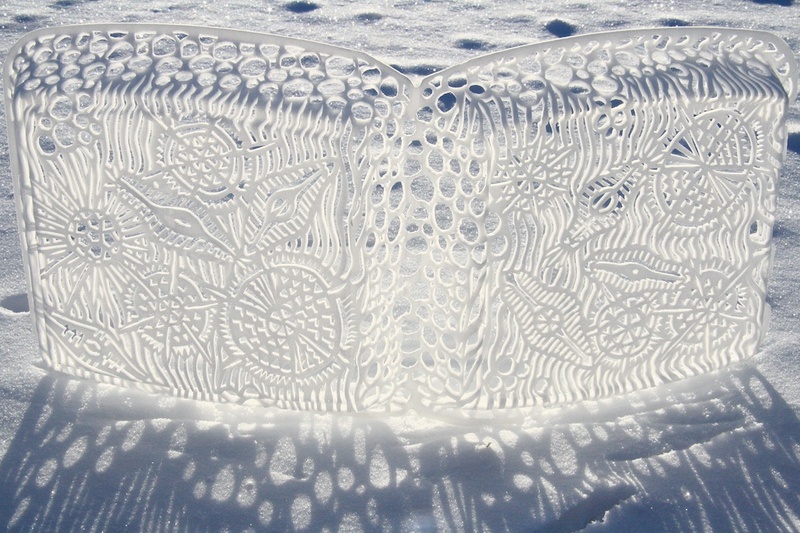 Pauline Bindoff wrote the poem New Space in response to this challenging exhibition. Jennifer L. Lavers* Institute for Marine and Antarctic Studies, University of Tasmania, 20 Castray Esplanade, Battery Point, TAS 7004, Australia *Corresponding author: tel: +61 03 6226 6379; e-mail: jennifer.lavers@utas.edu.au Lavers, J. L.
Population status and threats to Flesh-footed Shearwaters (Puffinus carneipes) in South and Western Australia. – ICES Journal of Marine Science, doi: 10.1093/icesjms/fsu164. Received 27 July 2014; revised 20 August 2014; accepted 29 August 2014. Seabirds are considered reliable indicators of the marine environment due to their reliance on ocean-based resources and position at the top of the marine foodweb. The status of the world’s bird populations have deteriorated over the past 20 years with seabirds declining faster than any other bird group. For some seabird species, a lack of data or synthesis of available data limits our ability to detect changes in population trends and gain insight into the condition of the surrounding marine environment. The Flesh-footed Shearwater (FFSH; Puffinus carneipes) exemplifies this with demographic and count data either absent or outdated for most breeding islands. Results of a survey of 20 FFSH breeding islands in South and Western Australia during 2011–2014, and a synthesis of all available data indicate the current global population is substantially smaller than previously thought, comprising no more than 74 000 breeding pairs. While much of the reduction in numbers is due to outdated burrow counts which are shown to be a poor measure of population size in this species, there is evidence of a decline in numbers on at least six islands that account for 40% of the world’s population. A review of novel and existing data on FFSH breeding habits (burrow occupancy and density), concurrent threats, and population size in South and Western Australia are presented here along with priorities for management of this declining marine predator. Keywords: apex marine predator, cumulative mortality, Flesh-footed Shearwater, indicator species, Puffinus carneipes. Plastic pollution was part of the extensive program within the Ultimo Science Festival, Sydney, 2013. The arts and science in dialogue. Program for the Ultimo Science Festival at The Muse, ABC Foyer, UTS Living Data Atrium 12 – 21 September 2013 Amongst a range of artists at this, the second Living Data inspired exhibition at the Muse, are Eveline Kolijn and Leanne Thompson. Eveline is a featured artist on this site and in this section responds to plastic pollution in a series of work titled Sublime Waste. Sublime Waste Foam Spill is a creative and stunningly beautiful collection of assorted hand-cut, recycled, Styrofoam clamshell containers and cups, 2011. View the full range of these works – follow the arrow – and be confronted by Evelyn’s challenging use of the fragile forms of the diatom (plankton) as they emerge from the ubiquitous evidence of polystyrene pollution. Marine Scientists confirm they are sampling six times more plastic particles than phytoplankton around the plastic Gyres amassing in the oceans. Follow Chris as he returns to Midway during 2011 to sensitively encapsulate the beauty and specialness within the pathos of the process emerging in our far away places. ABC Science unit uses the Science Show, Off Track and Catalyst to tell the story of marine plastic pollution. Listen to Robyn Williams on the ABC Radio National Science Show as he expands our understanding of Plastic Pollution in interviews with Dr Jennifer Lavers, Ian Hutton and with Captain Charles More: Dr Jennifer Lavers: documenting marine plastic ingestion by the flesh-footed shearwater of Lord Howe Island. Of particular concern is the capacity of plastics to attract chemicals subsequently absorbed by marine animals and birds. Hear Ian Hutton, ecologist, climatologist and curator of the Lord Howe Island museum, on Radio National’s Off Track. 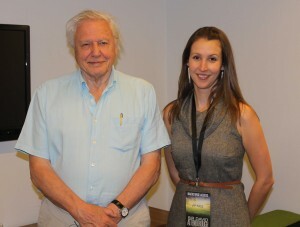 Jenn Lavers with Sir David Attenborough, after Sir David’s ‘Life on Earth’ seminar in Sydney, July, 2013. He had requested to meet Jenn, keen to get an update on the Plastic Oceans film with which she is involved – an early draft of which was premiered to UNESCO in June with the aim to generate the funds needed to finish editing. Read Jenn’s newest article Seabird Islands in a Plastic Soup released in Overcoat Magazine 15th July, (page 87-106). Captain Charles More: In 1997 Charles Moore captained his boat from Hawaii to California. He sailed through the doldrums, an area of calm winds and seas, passing through the North Pacific Subtropical Gyre. It is known as the Great Pacific Garbage Patch due to the accumulation of plastic. Captain Moore describes the vast area as a soup of plastic. The experience turned Charles Moore into a citizen activist. He has written a book, Plastic Ocean trying to raise awareness of the problem plastic has become as it finds its way into the stomachs of almost all marine creatures. Now see ABC TV’s Catalyst feature Plastic Oceans: In our throw away world a plastic bag outlives it’s usefulness after around fifteen minutes. A plastic bottle might last a little longer, party balloons a whole occasion. But the ocean likes to hang onto these discarded treasures for decades, even centuries with devastating unexpected results. People with a sense of adventure and a passion for preventing our oceans from becoming a ‘plastic soup’ are wanted to join a unique expedition. This nature tourism, scientific research and conservation project, East Coast Odyssey, will be the first expedition of its kind to tackle insidious micro-plastics in Australian waters. The mission, under the supervision of Monash University’s Jennifer Lavers is to collect data on the millions of multi-coloured plastic remnants killing marine wildlife at an alarming rate off Australia’s spectacular east coast. Please visit the East Coast Odyssey site and decide to be part of this important venture – or at least follow the research and outcomes. The Annual South West Marine Debris Cleanup on Tasmania’s remote south-west beaches reveals the extent of plastic pollution collecting on what might be expected to be the pristine beaches of this World Heritage area. The Bookend Trust’s 2012 interactive program focussed on marine debris around the coast of Tasmania. Plastic Trash Altering Ocean Habitats, Scripps Study Shows. Sharp increase of small plastic debris in the ‘Garbage Patch’ could have ecosystem-wide consequences. Findings: May 2012. Read report of the Scripps Institution of Oceanography researchers’ work off the coast of California which has determined that the amount of plastic floating in the Pacific Ocean has increased at least one hundred fold over the past 40 years. CSIRO is working to understand and ameliorate the impacts of marine debris on biodiversity. Dr Britta Denise Hardesty of the CSIRO Wealth from Oceans Flagship is investigating the threat posed by marine debris to Australian wildlife and ecosystems. Marine Debris and its Impact on Marine Living Resources CCAMLR Members continually monitor marine debris at several sites on the Antarctic Peninsula and other Antarctic and Sub-Antarctic islands. The Secretariat houses the CCAMLR Marine Debris Database which contains data from 13 sites. Redmap is an interactive website that invites the Tasmanian community to spot, log and map marine species that are uncommon in Tasmania, or along particular parts of the coast. The information collected is mapped and displayed on the site, to demonstrate over time, how species distribution may be changing. In December 2013 the Redmap program extended nation-wide, creating a chain of information gathering on species shift and change within the marine world off our coasts. Learn more about species shift and the new sea-life moving south with the East Australian Current and tracked by Redmap supporters at ABC News, 9 March, 2012. The Redmap tracking program supported the Lynchpin Project for 2012 – the making of Forests of the Seas – the stop-motion animation – which is promoted in the video section of the Redmap website.